This is part of a series (5 of 5 so far) that describes what happened to the Mongols of central Asia during and after Genghis Khan’s rule. I hadn’t read the previous books, and I’m sure that made a big difference in how much I enjoyed this one. 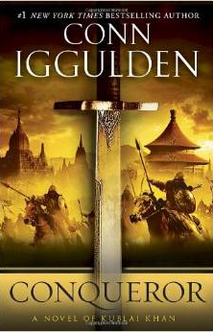 However, Conn Iggulden’s writing style is wonderful; he’s a master storyteller. That being said, this is fiction, not history. The characters may be based upon historical figures, but their actions and personalities are, apparently, entirely the author’s own. He’s taken a lot of liberty with history, and if that doesn’t matter to you, then you will surely enjoy the action and intrigue in this novel. I didn’t like the quick changes of POV between chapters, especially, but the story was fascinating.